Indian flutist Shri. Praveen Godkhindi will perform during the Diwali Night celebration Saturday, Oct. 17, at 5:30 p.m. in the College of Arts and Sciences auditorium. Milaap, the University of Wyoming Indian student organization will host Diwali Night Saturday, Oct. 17, at 5:30 p.m. in the College of Arts and Sciences auditorium. The event will be followed by a gala dinner at 8 p.m. in the Wyoming Union ballroom. No ticket is needed for the event, but one is required for the dinner. Tickets will be distributed at no charge at the Wyoming Union information desk Monday, Oct. 12, and Tuesday, Oct. 13, between 11 a.m.-noon. Diwali Night will feature a guest performance by Shri. 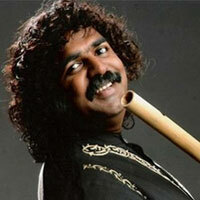 Praveen Godkhindi, a renowned Indian flutist, accompanied by Shri. Charudatta Phadke on the Indian percussion instrument, the tabla. Student performances also will be included. The Diwali festival, also called the "festival of lights" is celebrated in India through fireworks, lights, flowers, sharing of sweets and worship. "During this festival, people light up their houses and shops," says Anup Gondkar, Milaap event coordinator. "The whole idea is to celebrate and be happy."